UFC will move forward with one of its biggest ratings draws of 2009, Kimbo Slice. After winning his first UFC fight at the TUF Finale, Kimbo Slice is now rumored to face another fighter from The Ultimate Fighter 10. Conflicting reports indicate that Kimbo Slice’s next opponent will be the “brain rattled” former NFL player, Matt Mitrione at UFC 113. I don’t think I have ever seen a fight on paper so manipulated in my life from the UFC. Obviously, this is a set up to give Kimbo a win. The lack of ground experience between both fighters should place this match right at the top of the local Tough Man contest. Slice’s previous fight against Houston Alexander was booked to be a standup war. This fight has no chance to be anything other than a standup war, considering that neither guy will have a clue as to what to do if it goes to the ground. I can understand the Kimbo Slice experiment, but I don’t necessarily agree with it. UFC president Dana White was very outspoken about Slice before he fought in the UFC. He said the only way he would take Kimbo is if Kimbo entered TUF, which he did. Slice was a ratings bonanza for the show. Slice’s fight on the show against TUF winner Roy Nelson generated a 6.1 rating bringing in over five million UFC viewers. Slice may have lost the fight, but the UFC won the battle with a gigantic rating. Following the fight, the show continued to tease for weeks that Slice would fight again. He never did and turned down a prospective opportunity, citing arthritis in the knee. White seemed to be stunned and angry about Slice’s decision. Slice was also exposed on the show for not having much of a ground game. Additionally, the explosiveness that most expected to see from Slice was left in those You Tube videos of Kimbo Slice fighting local guys for $1,500. The jury was out as to how valuable Kimbo would be to the UFC following the television show. Kimbo Slice’s first official UFC fight came on The Ultimate Fighter 10 finale, live on Spike TV. Once again Slice was a ratings success. 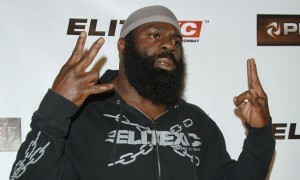 5.2 million viewers tuned in to see Kimbo Slice beat Houston Alexander. Unfortunately those viewers were treated to one of the most ridiculous fights of the year. Alexander did everything he could to avoid contact and Slice won a very boring fight. Alexander was subsequently fired from the UFC following his performance in the fight, specifically his lack of engagement. It was obvious that the UFC had a big problem with Kimbo. He is a proven draw, yet he is way out of his league fighting in the UFC. Between his lack of experience and his knee problems, the UFC was going to have a hard time getting a fight out of Kimbo that would live up expectations. I look at this proposed fight with Mitrione as a last ditch effort to save their investment. I find the fight to be a bit of hypocrisy coming from the UFC. Dana White blasted Elite XC after Seth Petruzelli claimed he was offered more money to keep his fight with Slice on their feet. By firing Houston Alexander for not engaging with Slice, White is basically guilty of the same thing that he accused Elite XC of doing, which was manipulating a fight and hurting the integrity of the sport. At this point Alexander’s firing is well known and the word is out among Kimbo’s opponents that you better engage in a stand up war or there will be repercussions. It is practically the same thing and it goes against everything the UFC claims that MMA is about. Try defending this one to a UFC critic who says that the UFC is barroom fighting with no skill. This is a golden opportunity for Matt Mitrione. Mitrione was arguably the most controversial fighter on TUF. Mitrione’s first fight on TUF was a great one, as he and Scott Junk had a standup slugfest. Following the fight, Mitrione did nothing but complain and even claimed at times that his “brain was rattled.” Mitrione was defeated in his next fight by James McSweeney, losing to a guillotine choke on the ground. Mitrione came back and won his first official UFC fight defeating Marcus Evans via knockout on the TUF 10 finale. The fight is far from a done deal, yet there are plenty of reports that indicate that there is something to this matchup. If Kimbo Slice vs. Matt Mitrione does happen, the chances are pretty good that you will see a standup war between the two. Mitrione showed he had a great chin in that fight with Junk and should be able to hang with Kimbo. As for Kimbo, I just think that the arthritis in his knee will prevent fans from seeing the explosive Kimbo Slice that most MMA fans hoped to see in the UFC. Regardless, I think Dana White will get his wish and at least have the fists flying at UFC 113 if this fight comes to fruition. Check out EliteXC: Street Certified – Kimbo Slice vs. Tank Abbott on DVD by clicking here.